The mouth-watering collection of cars, arranged by the Teesside Yesteryear Motor Club, will feature many of motoring’s top names including Aston Martin, Ford, Jaguar, Mercedes, MG, Porsche, Rolls Royce and Triumph and is the latest highlight to be announced ahead of the event. Notably, some 17 E-type Jaguars alone will be present – the E-type is arguably the most iconic car ever produced by the British automotive industry and this year is celebrating its landmark 50th anniversary. Some are capable of fetching up to several hundred thousands of pounds at auction. A major part of the weekend is for public including children to dress in period style to add to the atmosphere. Elsewhere, already confirmed are spectacular air displays (on the Saturday) from the evocative Hurricane and Spitfire WWII fighter planes and (on the Sunday) a Jet Provost. 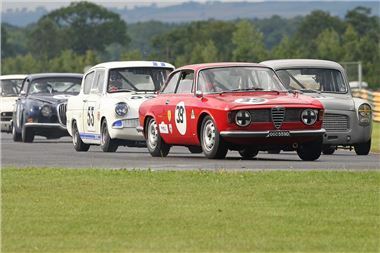 On track, no fewer than 18 races organised by the high-profile Historic Sports Car Club are scheduled to take place during the two-day festival for an exciting variety of saloon, single-seater, GT and sportscars from the Forties through to the Seventies. And the HSCC has indicated that it is presently on course to beat the 180-plus entries registered for last year’s inaugural event. Meanwhile, also on the Sunday, a WWII Chaffee tank will provide further thrills by discharging blank rounds in the build-up to each race. That is after spectators have been taken for passenger tours around the Croft Circuit in period double-decker buses throughout the morning. Croft Circuit Manager Tracey Morley commented: “With under two weeks to go, everyone here at our circuit is hugely excited about what is in store for the public during the Nostalgia weekend. “It’s a golden opportunity for people to attend a major social event that’s all about rolling back the years with of course all the added excitement of a high-octane retro theme based around motoring and motor racing. There is something hugely enchanting about events of this nature – as seen at the likes of the Goodwood Revival and Silverstone Classic events further south – and the Nostalgia weekend is sure to capture the imagination of many people from across the region and further afield.